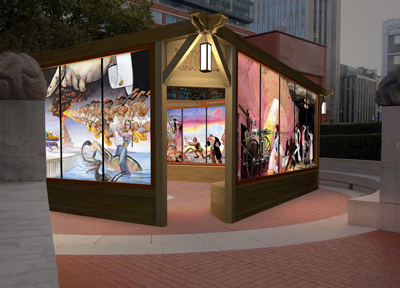 Visual artist David Normal brings the British Library’s collections to life in an “epic suite of murals” called Crossroads of Curiosity. Unveiled at the library at a special event on the eve of the summer solstice (20th June), the art installation – which has its origins in a work first created for Nevada’s Burning Man Festival in 2014 – juxtaposes images from millions of digitised book illustrations the library released onto Flickr in 2013. 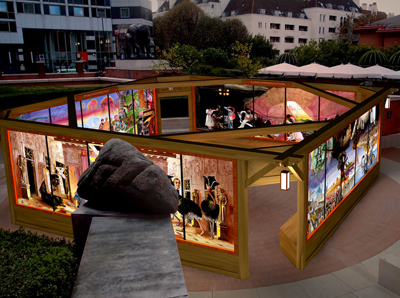 The installation can be seen in the library’s piazza in King’s Cross until 8th November. Entry is free. For more, see www.crossroadsofcuriosity.com. PICTURES: Courtesy of the British Library.